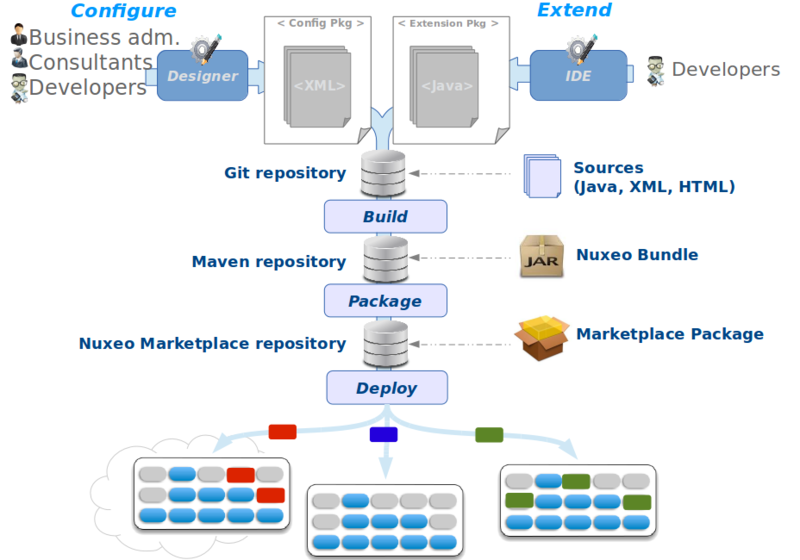 This document explains how the Nuxeo Platform can be used to provide an application factory system that allows to instantiate on demand applications for a given configuration. Inside a large company, especially when it is international, it is very common to require the same application deployed for several departments or several countries. 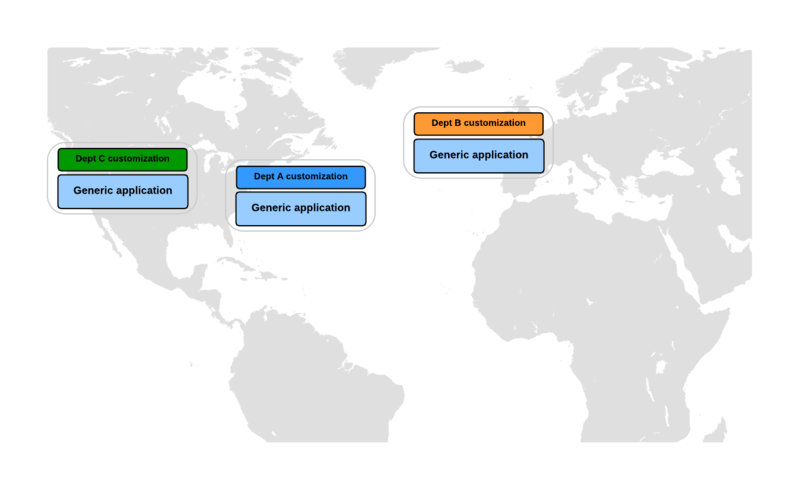 Actually, even if at the beginning all departments or countries want the same application at some point they usually identify some "small differences" that justify that they need some custom configuration and possibly their own deployment too. Urbanization: You don't want each department to deploy its own software solution. Maintenance and upgrade: You don't want to multiply maintenance price by the number of logical deployments. Deployment speed: Deploying a new "instance" should be fast and painless. For similar reasons, inside a large company you can easily have several projects that would benefit to share the same common ground. Typically if you have several Case Management projects for different departments or several DAM projects for different countries. You first need to build a common application, ideally without starting from the ground. You want then to be able to customize it for a project or client, without compromising upgrade possibilities. This approach exists for a very long time and has the big advantage to provide a complete sharing of all resources which may seem to be the most economic option. A configurable notion of tenant: By default a tenant is a domain. A user isolation at tenant level: Except for main administrators, users and groups and defined and managed at tenant level. A data isolation at tenant level: Documents are isolated a on per tenant basis using a security policy and ACLs. 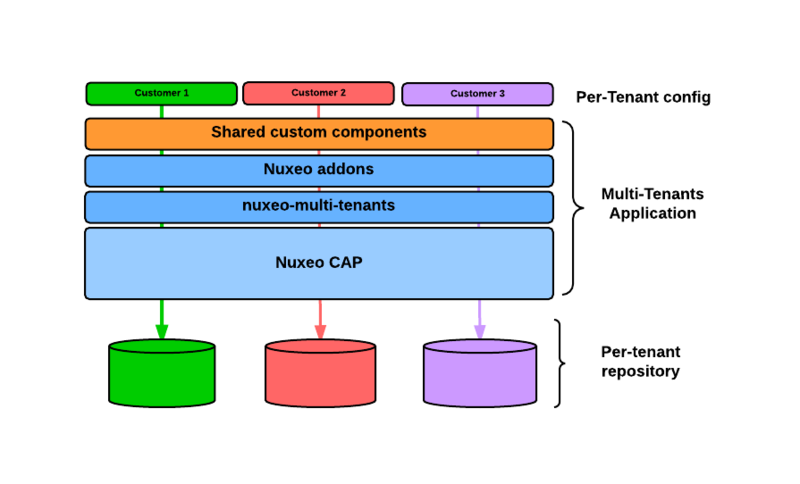 Depending on the way you define a tenant, you could also use completely separated repositories for each tenant (allowing to have physically separated Databases and BinaryStores). The multi-tenant model has some intrinsic limits. The first drawback is that since all resources are shared inside the same application, one tenant can create issues by consuming too many resources or creating errors. The application layer can manage some quotas (the platform provides that for the storage for example), but as long as the tenant isolation remains at application level, it is not possible to prohibit one tenant to use too much CPU, memory or bandwidth. As long as all tenants run inside the same application, the configuration and customization must be limited. Only a very limited number of extension points are tenant aware. Concentrating the different projects/customers/tenants on the same application automatically makes it highly critical. Hosting three non-critical applications for three separated continents is easy. But if you run them as three tenants on the same application the maintenance window automatically become very small and the application needs to be HA 24/24 7/7. In terms of project constraints, it also means that all projects need to agree on the upgrade schedule: Sadly, when the number of projects increases, getting that agreement can end up being much more complicated than the actual technical upgrade itself. With multi-tenants the easiest solution is to use a single and big database server for all the tenants. The drawback of the approach is that when you need to scale because you need more performances or simply because you are adding a lot of tenants then you can be stuck because Database servers don't easily scale out. As long as the data isolation is handled at application level, you can not rely on system-level backup restore tool, at least, not if you want to restore a data from a particular tenant without restoring the data for all tenants. Tenant resource are really reserved and not accessible to other tenants, including CPU, Memory, I/O. Each tenant should use a different runtime so the configuration from a tenant can never impact another tenant. 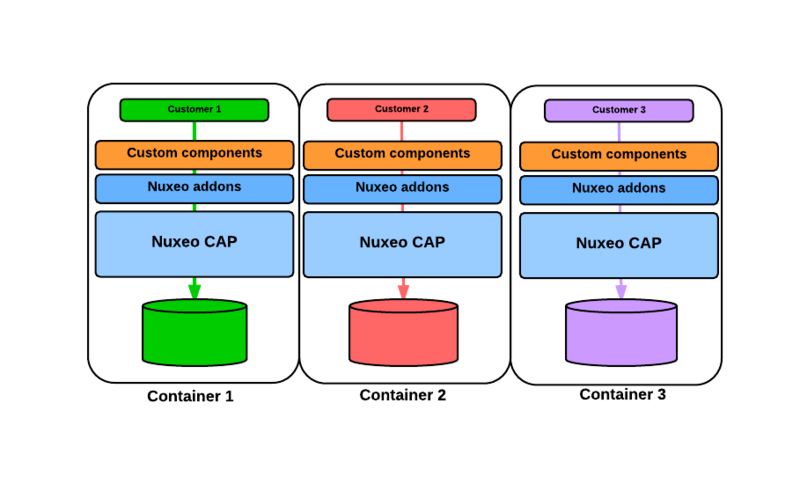 Basically the idea is that for each client a set of dedicated containers running Nuxeo is used. That's because we are convinced that this approach has much more value that "standard multi-tenants" that we started investing on the container based approach. Openshift is the container application platform made by RedHat. 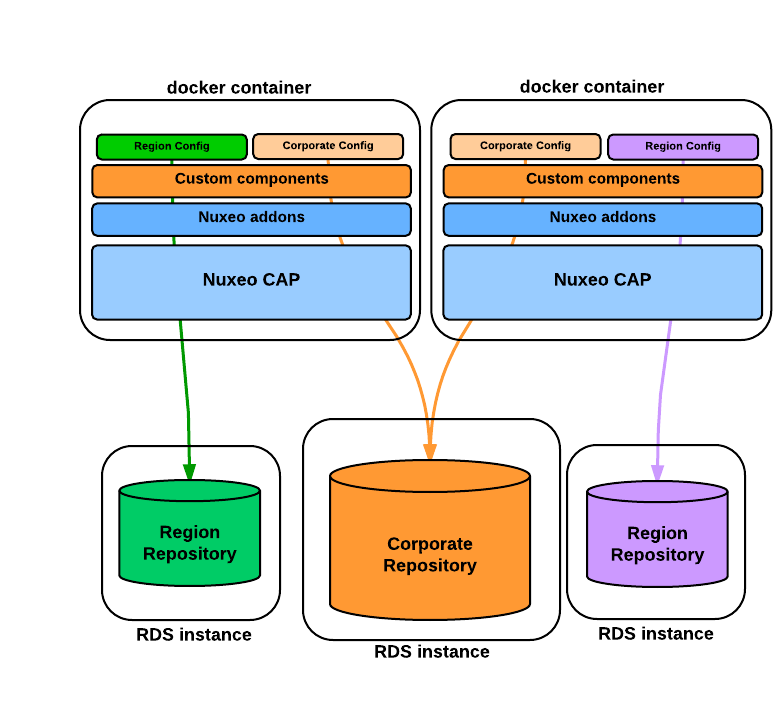 It relies on Kubernetes and is able to run and schedule containers on a cluster of nodes. Openshift also adds a specific build workflow that allows to build source code and convert it in Docker image. to bind the Nuxeo service to a URL. Openshift use the Docker lightweight container technology to multiplex several application containers by sharing the underlying infrastructure/VMs. Because lightweight containers are cheaper to create or to shutdown, this 2-level container architecture allows to have a very reactive provision policy so that we can quickly scale the application up or down. 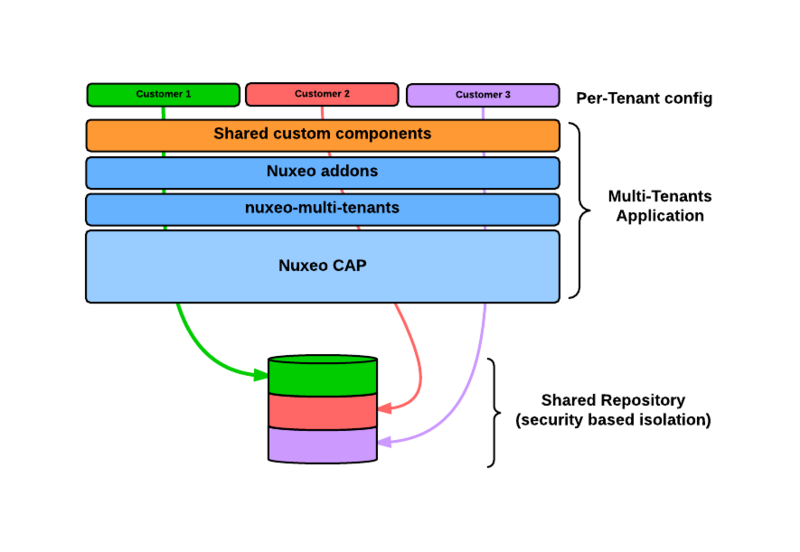 With Openshift deployment you can deploy one or several Nuxeo environment on the same set of servers, and you can even share the backing service for each Nuxeo environment. Let's consider a use case where in a large international company each region must have its own "flavor" of the corporate DAM.